Letter signed by Theodore Herzl sent to Mr. George regarding the collection of the "shekels" in Russia. Vienna, December 1903. Stencil print with Herzl's signature at bottom right. 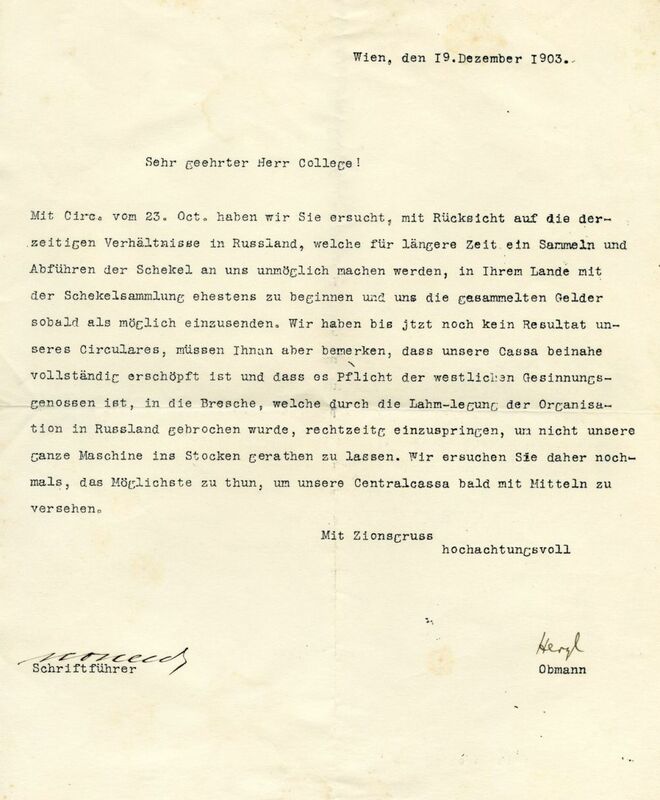 In his letter, Herzl addresses Mr. George and asks that due to the tense situation and the strict government supervision in Russia, he should collect the shekels for the Zionist Organization as soon as possible and keep them with him, despite the difficulty. Herzl is concerned that due to the various limitations Zionist propaganda would come to a halt, so he encourages him to work energetically on the issue, and he hopes that assistance will arrive from the West. Herzl's letter was written a few months after the Kishinev pogrom, as the conditions for Russian Jewry worsened and the Zionist Organization was persecuted by the government. leaf, paper. 21x28 cm. Very fine condition.